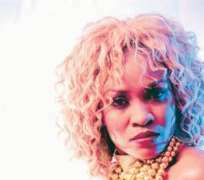 When Muma Gee started cruising in her Infinity jeep, it was very evident that the singer has finally 'arrived' as she was regarded as one of showbiz's larger babes. But her 'machine,' with a customised plate number, MUMA GEE, was in a bad shape when life and Beat saw it not too long ago. Going by the state of the car, one could have concluded that the Lagos big gal was involved in a ghastly accident. But she told Life and Beat that some forces bigger than her, actually dealt with her not too long ago. According to her, somebody bashed her car recently near Ikeja Cantonment in Lagos. But before she could even say 'Jack Robinson', the person that bashed her car ran into the cantonment and returned with some soldiers. Muma realised that the mean-looking men were ready to skin her alive and refused to pull over. But according to her, the soldiers were not done with her yet; they shattered the front and back windscreens and fled! That was when Muma woke up from her 'trance' and, like James Bond, made a crazy 360-degree turn and turned on the guys. Muma said she then reported them to their superiors and the soldiers were made to face the music .